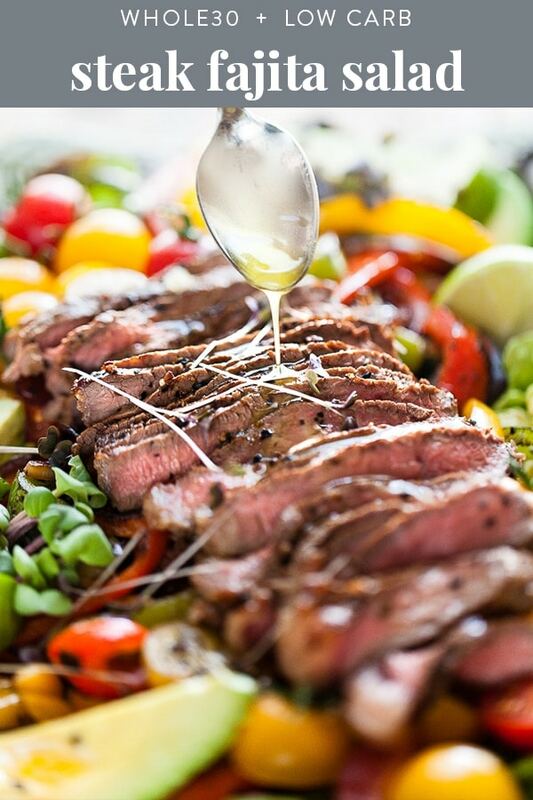 This fajita salad is loaded with tender steak, veggies, and a quick and flavorful dressing. Whole30, low carb, and keto, it’s a healthy Mexican dinner recipe that you can throw together in about half an hour! Whenever I crave light and fresh dinners in my meal plan, I often end up transforming a lot of my regular restaurant favorites into salads. 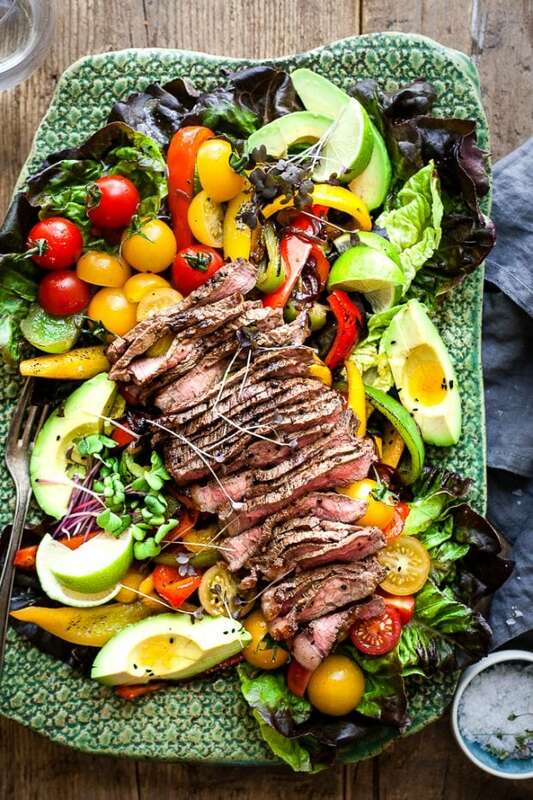 This Whole30 Fajita Salad with steak, for instance, was inspired by classic restaurant-style fajitas. But hey, we will go ahead and skip the tortillas, cheese and sour cream and instead add lots of crunchy seasonal veggies, making this a healthy, yet filling salad. Yep, you heard me. 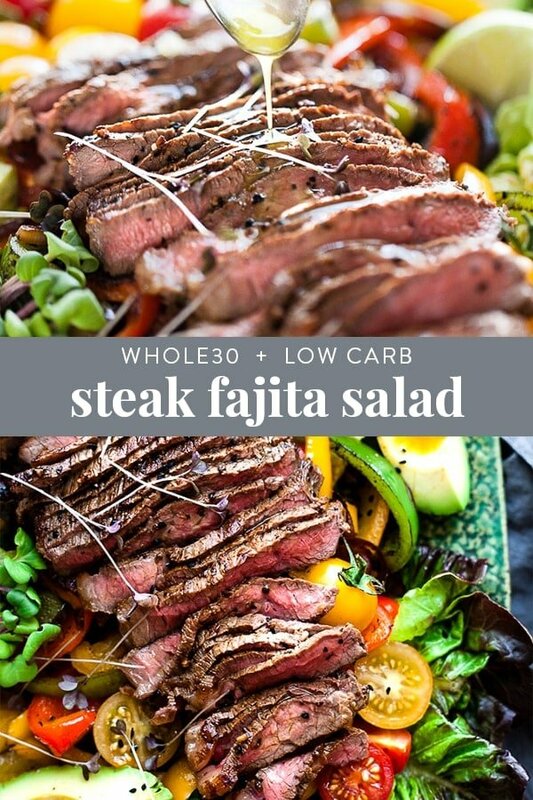 This Whole30 Fajita Salad is really good for you – low carb and keto! 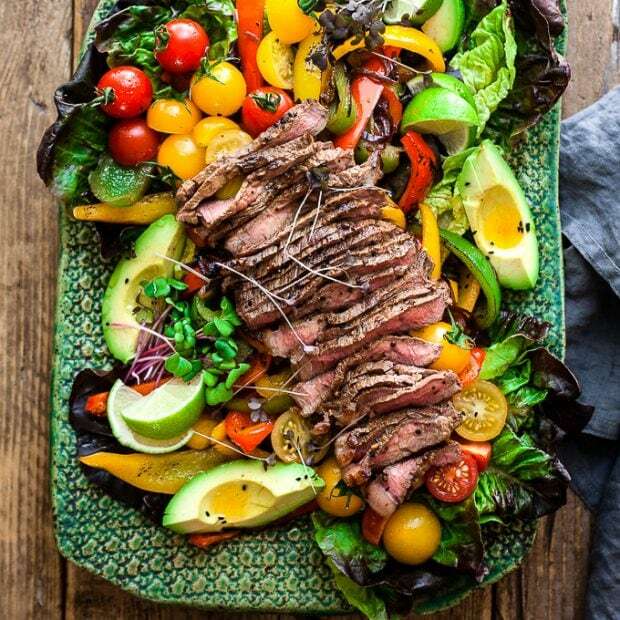 Picture perfectly cooked slices of juicy, spice-rubbed flank steak paired with charred bell peppers, creamy avocado, sweet tomatoes and caramelized onions on a bed of crunchy, chopped romaine lettuce. The whole Mexican affair is tossed with a zesty chilli-cumin-lime- vinaigrette. Delicious! This Whole30 Fajita Salad recipe comes together in only 30 minutes, making it the perfect healthy dinner for weekdays. 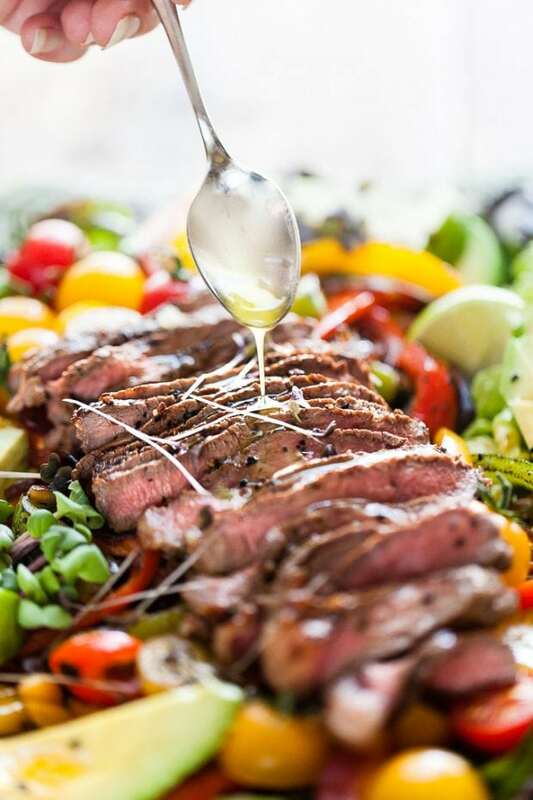 Both salad dressing and steak are seasoned with a Mexican spice blend featuring chilli powder and cumin, to really put the fajita in this salad recipe. Get all the flavours of Mexican restaurant fare minus all those calories from tortillas, cheese and sour cream. Your steak will cook more evenly if you take it out of the fridge about 20-30 minutes before frying it. In addition, a slightly warmer steak will brown better because you don’t need to waste the pan’s energy to take the chill off of your steak’s surface. Wait until the skillet is smoking hot, before adding the meat. That way, your steak will retain more juices as it cooks. The cumin-lime dressing can be made up to 2 days in advance and stored in a covered container in the refrigerator. Want to use this Fajita Salad recipe for meal prep? No problemo! Undressed Fajita Salad leftovers can be stored in a covered container in the refrigerator for up to 3 days. Out of a couple of spices? Use ready-made Taco Seasoning for meat and dressing. Substitute chicken for flank steak for a Chicken Fajita Salad. Note, that the cooking time of the meat will differ. I don’t eat red meat. What can I use instead of beef? Steak is not a must. You can absolutely make a perfectly fine Chicken Fajita Salad. To save on prep time, use chicken tenders for this recipe. They are slightly bigger than chicken breast strips, so be sure to add enough time to cook them through. Is there any way I can turn this into a Vegan Fajita Salad? There sure is! How does a Portobello Fajita Salad sound? Cut the portobello mushroom caps into 1/2-inch thick slices. Place them in a medium bowl and drizzle them with 2 tablespoons olive oil. Sprinkle with the same spice mixture, we use for the steak and toss gently with your hands to evenly coat the mushroom pieces. Place a skillet or pan over medium heat. Once hot, add 1 tablespoon olive oil along with the portobellos, making sure not to crowd the skillet. Cook the mushrooms for 3-4 minutes, turning occasionally with tongs, until tender. Transfer mushrooms to a plate and fry the remaining veg in the same pan. We start by making the dressing: Whisk all the ingredients together in a small bowl until combined and emulsified, then set aside. For the Fajitas, heat a 10-inch cast iron skillet over high heat for about 10 minutes. The pan should smoke just a bit when it is properly heated. Meanwhile, liberally season the flank steak with salt, pepper, cumin, and paprika on both sides. Add the flank steak to the pan and cook undisturbed until a deep golden- brown crust forms, about 4 minutes. Flip the steak and cook until an internal kitchen thermometer registers 130°F for medium-rare. Check and flip the steak every 2 minutes, about 4 minutes more. For a medium cooking grade, cook until the steak registers 140°F, about 6 minutes more. Transfer the steak to a cutting board and tent with aluminum foil to rest for at least 10 minutes. Reduce the heat to medium and add the more oil to the skillet. Add the onion, peppers, salt, and pepper, and cook, stirring occasionally, until softened and lightly charred around the edges, about 8 minutes. Remove the pan from the heat. Now it’s time to bring your Fajita Salad together. Spread the lettuce over a large platter. Slice the steak across the grain. 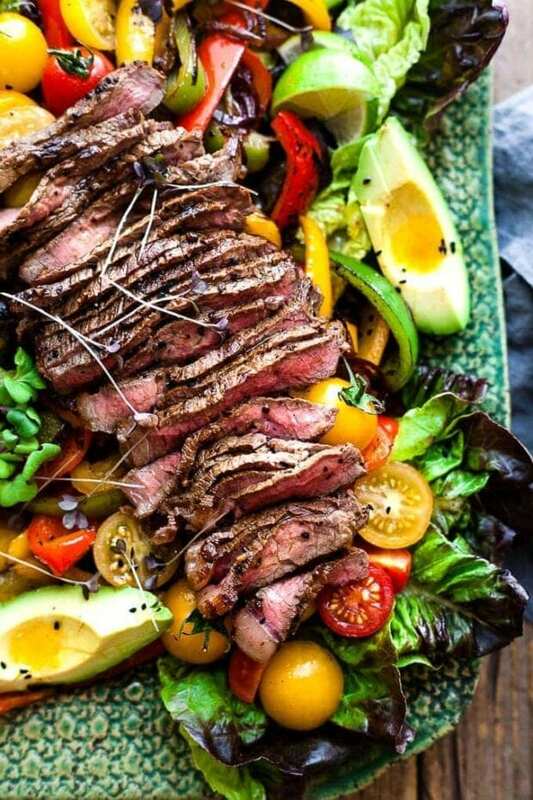 Add the steak slices, onions, peppers, tomatoes, and avocado to the greens, and drizzle your Fajita Salad with the dressing. Toss to combine and serve warm. 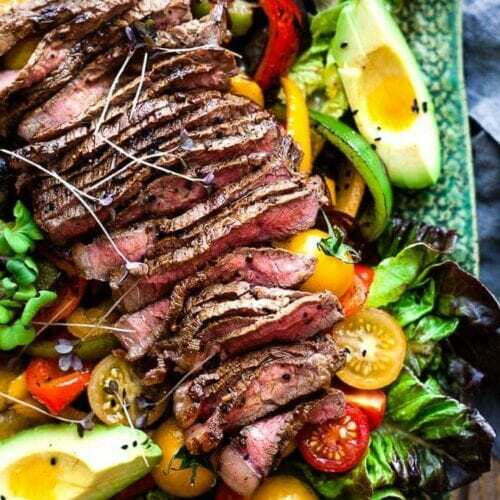 This fajita salad is loaded with tender steak, veggies, and a quick and flavorful dressing. Whole30, low carb, and keto, it's a healthy Mexican dinner recipe that you can throw together in about half an hour! Make the dressing: Whisk all the ingredients together in a small bowl until combined and emulsified; set aside. Make the salad: Heat a 10-inch cast iron skillet over high heat for about 10 minutes; the pan should smoke just a bit when it is properly heated. Meanwhile, liberally season the steak with salt, pepper, cumin, and paprika on both sides. Add the steak to the pan and cook undisturbed until a deep golden- brown crust forms, about 4 minutes. Flip and cook until the steak registers 130°F for medium-rare, checking and flipping every 2 minutes, about 4 minutes more. For medium, cook until the steak registers 140°F, about 6 minutes more. Transfer the steak to a cutting board and tent with aluminum foil to rest. Reduce the heat to medium and add the oil to the skillet. Add the onion, peppers, salt, and pepper, and cook, stirring occasionally, until softened and lightly charred around the edges, about 8 minutes. Remove from the heat. Speed the lettuce over a large platter. Slice the steak across the grain. Add the steak, onions, peppers, tomatoes, and avocado to the greens, drizzle with the dressing, and toss to combine. Serve warm. Make ahead: The dressing can be made up to 2 days in advance and stored in a covered container in the refrigerator. Storage: Undressed leftovers can be stored in a covered container in the refrigerator for up to 3 days. Note 1: You can use a hand blender to emulsify the dressing and keep it creamy. Note 2: To properly rest the steak, leave it tented in foil for at least 10 minutes before slicing.